If you have to get rid of old furniture, it's not a matter of just "throwing it in the trunk." Most folks don't own a truck and furniture can be too big for a car. What to do? You could rent or borrow a truck, or you can consider getting a handy rental dumpster. Getting rid of your old furniture with a dumpster rental can be a convenient, cost-effective and versatile option for your old furniture removal project. While you may have asked yourself, "Where can I take old furniture to dump it legally?" you may have already decided that hauling and dumping it yourself isn't really feasible. Not to worry! There are options and a rental dumpster from Junk King is one of the best. Our goal is to make the entire junk hauling and dumping process easy for you. And this includes old furniture removal. Let's look first at the other option - having us pick it up and haul it away for you. If you prefer the efficiency and convenience of having a friendly and professional team show up at your home (or office) for furniture and junk hauling and removal, Junk King is the firm to call. We make it crazy simple for you to book an appointment for a pick up, or even for a series of appointments for the duration of your job. With this option, our junk removal team will come to you, remove your furniture, load it into our truck, and then dispose of it in a safe, eco-friendly manner. While this is a great option, sometimes you want to have a few days to move things around and a convenient place to stage your old furniture besides the driveway. That's when you should consider the MINI Dumpster option. 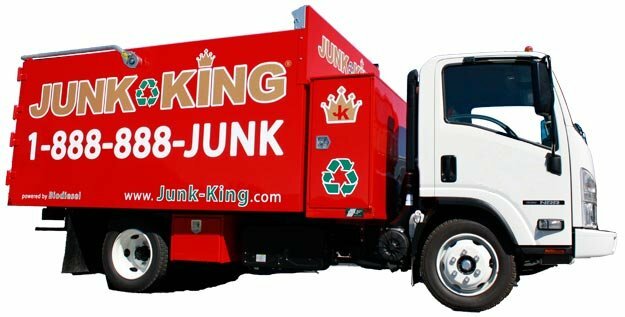 At Junk King, we've made this process easy for you, too. With our simple MINI Dumpster drop-off service you can have a revolutionary, user-friendly dumpster delivered directly to you. These rental boxes are attractive, versatile and so easy to use. They are a great as self-service debris boxes for your old furniture, as well as for landscaping project debris, debris from home renovation projects and any other type of large cleanups. Really, the only thing we ask that you not dump in them is hazardous waste. And these dumpsters are easy to use. At just 12 cubic yards, they are smaller in size than those massive, ugly commercial boxes you are familiar with. While being smaller means it's a dumpster that is compact, affordable and easy to load, it still has an impressive load capacity. Try to visualize the bed of a full sized pickup truck. When you load it up to the edge of the bed sides, it will hold 2.5 cubic yards of material. Now visualize five of these pickup loads: that's what our MINI Dumpster can hold! Our rental dumpsters can fit in just about any space you need it to at your home or place of business. And all of our MINI Dumpsters are equipped with special wheels so that these driveway-friendly boxes can be placed on your site without causing damage to your driveway or property. Got Old Furniture? You Can Rent a MINI Today! 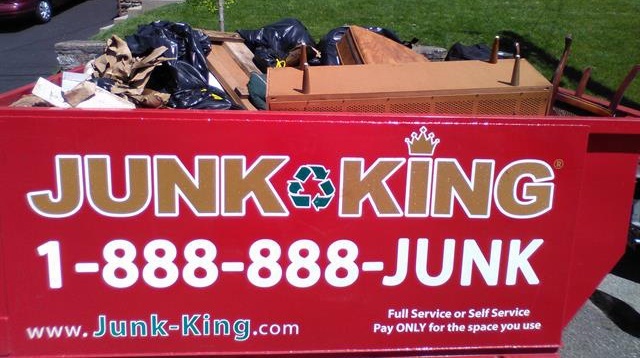 Junk King makes it easy and affordable. Once we drop off the Junk King MINI Dumpster , you can fill it on your own timetable, and we'll pick it up three days later. Remember: the MINI Dumpster can take on large items like your old furniture and appliances, as well as large trash, construction debris and junk from remodeling projects. In fact, just about everything except hazardous waste can be handled by the Junk King MINI. And we keep things simple with fair, upfront pricing. Most other dumpster rental firms use a flat fee pricing structure, which simply means you have to pay the same price even if you don’t fill up the entire dumpster! But not with Junk King! We let you pay only for the space you use. Whether you are upgrading your furniture or preparing to relocate, we provide you with the tools you need to haul away unwanted old furniture. We offer a warm and friendly crew that will do the heavy lifting for you or, if you prefer, a fleet of MINI Dumpsters that let you to do it yourself. Our professional and insured trash removal team will show up at your home or office, and we will call 15 minutes before we arrive at your site. In addition, we’ll give you a free estimate based on how much room your items take up in our truck. You point and we haul your items into our junk removal trucks, with no hidden fees. Ready to get rid of that junk? It’s as simple as 1, 2, 3. You make an appointment by booking online above or by calling 1.888.888.JUNK (5865).